In the newspaper today, it was disclosed that a Harrison Township man "accidentally" shot his wife while cleaning his handgun. The incident, in my opinion as a Firearm Safety Instructor, was completely avoidable and would not have happened if some basic firearm handling rules were understood and followed by the operator. Ironically, this unfortunate event was preceded by another preventable incident a couple of days ago whereby another man shot himself while reaching for his wallet at a Home Depot Store. The very first thing a person should do before ever attempting to handle or operate a firearm is to completely read and understand information in the Operator's Guide. If there is anything that is not clear, the operator should consult with other trusted sources of info: the manufacturer's web site, the manufacturer's help line, the gun dealer who sold him the gun, or a well regarded firearm safety expert. Nearly all Operator's Guides will inform the user when his firearm should be cleaned. Most will say that at a minimum that it should be "field stripped" and cleaned after every discharge. Additionally, when "not in use" the gun should be inspected and cleaned at a prescribed interval. Failure to properly store and clean a firearm could lead to rust, corrosion, malfunctions, or unsafe pressures. - Always Treat Firearms As Loaded. - Always Keep Firearms Pointed In A Safe Direction. - Pick up the gun with his finger off the trigger and immediately point it in a safe direction and keep it aimed there. - Verify that the handgun is unloaded. - Re-Verify that handgun is unloaded. - Follow instructions in the Operator's Guide to safely disassemble the handgun. - Follow instructions in the Operator's Guide to clean the handgun. There is no such thing as an "accidental discharge," unless the firearm is defective. A handgun will not discharge unless it is loaded AND the trigger is pulled. If it failed to do exactly that, it would be unsafe to operate. The aforementioned incident was no accident. It was either intentional or negligent. 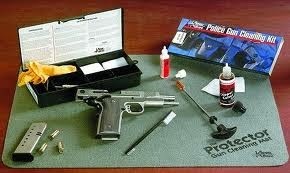 If you do not know how to safely clean or handle a firearm, you should not do so until you have been trained. If you need training, GET SOME.